A little over 30 years ago, on February 7th 1988, Michael Jordan dropped 40 points in the NBA All-Star Game and in the process won his first All-Star MVP award. His shoes that day, one of the most iconic and sought after Air Jordan shoes of all-time – The Air Jordan III’s. It could have so easily been different with Jordan disliking the Air Jordan II’s (not surprising since he’d broken his foot in them) and being courted by multiple competitors, but for the collaboration between an unconventional designer and athlete with an unrivaled talent. Saving Nike: “Phil Knight thinks I helped save Nike that day, I don’t know if it’s true or not, but that’s his perception.” – Tinker Hatfield. how? Jordan was about to sign with a competing brand. He was looking for an out. The Air Jordan III changed his mind. The rest as they say is history. Radically Perfect: The AJ3’s were truly revolutionary > mid top instead of the accepted wisdom of a high top, including a host of materials that had never been used on a sneaker before, and the first to include the now iconic Jumpman logo (on the front as a symbol of who was at the forefront of the shoe). “That’s so radical but perfect.” – Michael Jordan when first seeing the AJ3’s. 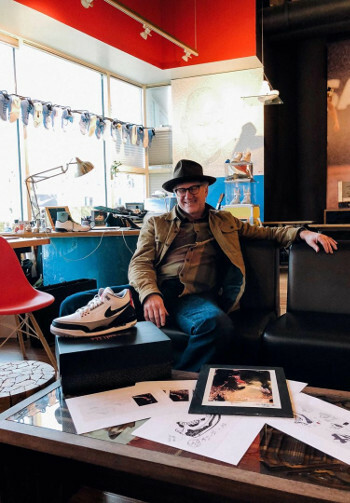 Tinker Hatfield’s creative debut: In the history of sneaker design there has arguably been no greater contributor. Why? Many reasons not least of which being the Jordan Brand subdivision he essentially created made Nike $2.25 billion in 2013 alone and accounts for nearly 60 percent of the American basketball shoe market. A shift of mindset: “I don’t think anybody in the business had quite grasped that there were athletes who were capable of being true collaborators. I came from the world of architecture. And of course, if you try to design a building for a client – especially if it’s intimate, like a home for a family or something personal – you have to be collaborative. 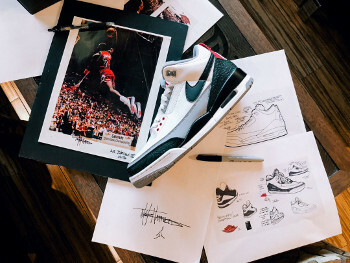 They’re part of the design team” – Tinker Hatfield. 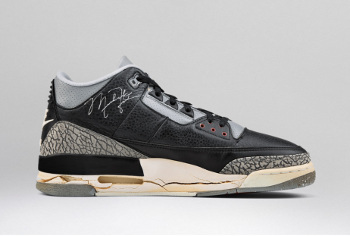 Starting a Culture: The AJ3’s have been re released more than any other shoe (in 1994, 2001, 2008, and 2011). And The 2001 edition arguably kicked off today’s sneaker-collecting culture by becoming the first Jordan to be re-released and sell out in full. Anniversary Edition: Nike are releasing a remastered version on 17/02/18 (Michael Jordan’s birthday). Personally I’ll be lining up for a pair.